Welcome to Forbes for August 8th, 2011 from Audible. This edition contains seven feature articles. In the cover story, we'll tell you about “America's Top Colleges” – The best years of life are also among the most expensive. Choose with care. Also, “From Dorm Room to $60 Billion” - 46-year-old Michael Dell Dropped out of the University of Texas in May of 1984. 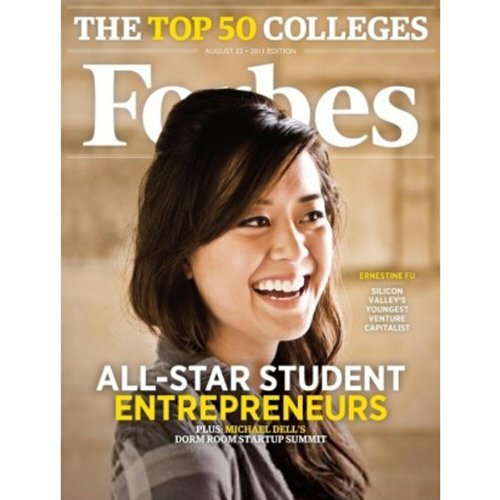 Next, “Forbes College All-Stars” - The nine young men and women who comprise our All-Star Student Entrepreneurs represent a wide swath of collegiate America. We'll also tell you about, “The Best Business Schools” - MBAs worth the cost: Graduates at the top business schools typically get their hefty investment back within four years of leaving school. Then, “What They Don't Teach You In Business School” - Nine things you absolutely need to know. Followed by, “The iPhone Uber-Hacker Who Keeps Outsmarting Apple” - The author of the World's most advanced iPhone hacking tools is a teenage college student. And in our final story, “Rallying Pharma's Rebels” -- Bernard Munos has a radical idea to save the drug industry: Take bigger risks and cut R&D. Want to hear more Forbes?